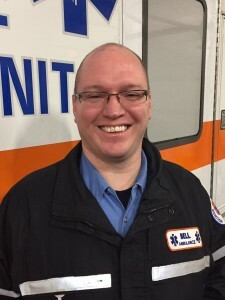 has worked as an EMT Crew Chief with Bell Ambulance in collaboration with Children’s Hospital of Wisconsin Critical Care Transport Team to provide care and transportation to various hospitals throughout Wisconsin. Bell Ambulance prides itself in giving excellent patient care and instilling in our employees our four operating priorities of Competency, Courtesy, Safety and Efficiency. From day one, Stephen has excelled in making sure our clients receive the best possible patient care and overall experience. This is evident in the numerous service awards he has received. Stephen possesses the ability to positively interact with anyone. Whether it is co-worker or patient, Stephen makes them feel welcome and lets them know that they are important to him. Everyone that crosses paths with Stephen appreciates meeting and getting to know him. Stephen served in the United States Army from 2002–2010 where he progressed to the rank of Sergeant. From 2004–2005 Stephen was deployed to Afghanistan. During his deployment, Stephen was the sole medic at the scene of a Humvee accident where he was responsible for triaging and caring for multiple soldiers until additional help arrived. This earned Stephen the Army Commendation Medal, an honor bestowed for heroism and meritorious service. It is for the reasons above, coupled with Stephen’s outstanding work ethic and his efforts to make his workplace the best possible, that he is deserving of the Stars of Life award in 2016. We are proud to say that Stephen is an employee of Bell Ambulance.